When falling off your bike, it is instinctive to put your hands out to break your fall. And, often times this means striking the pavement which can result in a fracture of the radial head or other bones in your wrist or forearm. Many times these injuries are caused by a vehicle hitting the cyclist from behind where they tend to go over the handlebars or when they are hit from the side. According to several orthopedic surgeons, upper-limb injuries and elbow injuries are the most common among cyclists because of the weight they put on their arms when they fall. When cyclists fall, they extend their arms and once their hand hits the pavement the force travels up the hand and wrist to the elbow and fractures at the head of the radius. These injuries are also seen in car accidents when the driver or passengers extend their arms against the steering wheel or dashboard to protect themselves. Typically this type of fracture consists of small cracks in the radial head but the bones are still fitted together. X-rays don’t always detect these at first. 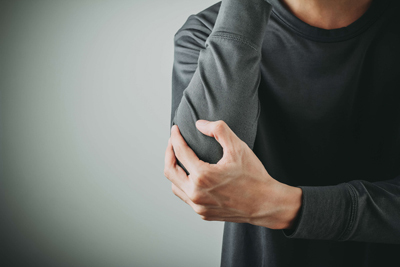 Usually this type of fracture can be treated with a splint or sling to keep the elbow from moving around. After a few days or more there should be a gradual increase in elbow and wrist movement but don’t try too much movement too quickly. This type of fracture is slightly displaced and involves a larger piece of the bone. Depending on the size of the fragmented bone, a sling or splint may be used for one or two weeks, followed by range of motion exercises. However, surgery may be required to remove small fragments of the broken bone so there are no future long-term problems with the elbow. Also, if a fragment is large and out of place enough, surgery may be required to stabilize the bone. This is done with plate screws. This is the most serious type of radial head fractures and it involves many pieces of broken bone that cannot easily be stabilized back into position for the elbow to properly heal. Often times there is damage to the joints, ligaments, tendons and muscles. In almost all cases, surgery will be required and in severe cases the entire radial head will need to be replaced to prevent deformity and disability. All radial head fractures will result in some loss of movement in the elbow and regardless of the severity of the fracture, exercises or physical therapy will be needed to regain movement and strength before getting back on the bike. With a proper examination by a doctor and treatment most people recover without too many complications. However, complications can arise especially with open fractures that break the skin. In addition to bleeding, infection is a risk. Another complication the patient needs to be aware of is possible damage to the blood vessels and nerves. Fragments of bone can injure the radial nerve which will impact the function of both the forearm and the hand. Did You Injure Your Elbow in a Florida Bicycle Crash? If you were an injured victim of a Florida bicycle accident caused by a negligent driver, you can receive the compensation you deserve. Before you discuss your accident case with an insurance adjuster and before you sign anything, you should speak to an experienced bicycle accident attorney. Jim Dodson is a cyclist, so he understands the issues Florida cyclists face when they ride. You can be sure he will put his 25 years of experience to work for you and get the settlement you deserve. Contact us online or give us a call at 727-446-0840.